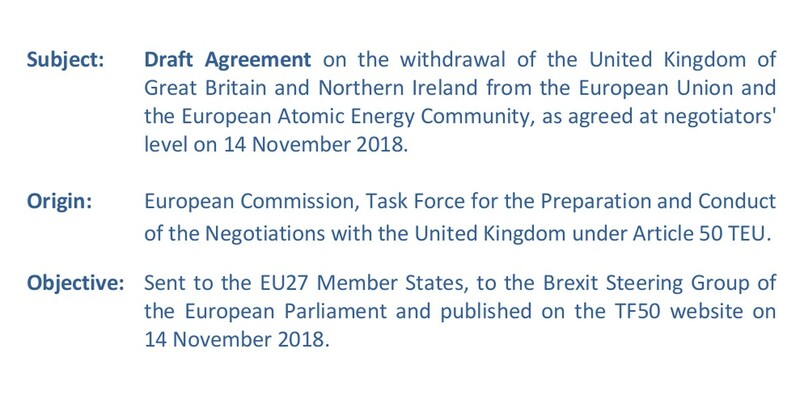 Brexit draft agreement 14 November 2018. The draft agreement on Brexit is a 585 page document that you can download from the European Commission. It’s a formal departure with select indefinite inclusion of the UK in certain EU rules, regulations, and obligations until such a time as a follow-up long-term deal is made. So, this draft agreement is for a transition period before another agreement is made. The two parties are supposed to seek a long-term deal for trade and rules between them by the end of 2020. The 2020 deadline may be pushed back. The UK has to continue EU payments during the transition period. EU law still applies to and in the UK during the transition period. The UK is not authorised to bring into force or apply “new international arrangements of its own” during the transition period “unless so authorised by the [European] Union”. The UK and EU will have a single customs union until a further deal is made. All goods fall within the customs union save fishery and aquaculture products. The customs union cannot be quit during the transition period without both sides agreeing to it. So, the UK is bound by that union until it reaches a further agreement with the EU. The UK and EU must have an economic “level playing field”. This means that the UK is not supposed to use its domestic law, regulations, subsidies, etc. to unduly advantage it over EU business competitors. Effectively, EU regulations are dominant in case of a clash. During the transition period, the UK financial markets will have their access to the EU limited from what they currently have. They lose single market access and enter into a system of “equivalence” with more basic access. The UK has to comply with select EU tax directives, sharing tax information with the EU and complying with EU code of conduct. In case of disagreements between the two parties on issues of law, the case must finally go to the EU court of justice.